One of my recent Postcrossing arrivals was this dandy postcard from a boy in Moscow, Russia, who is involved in the hobby with some help from his mother. 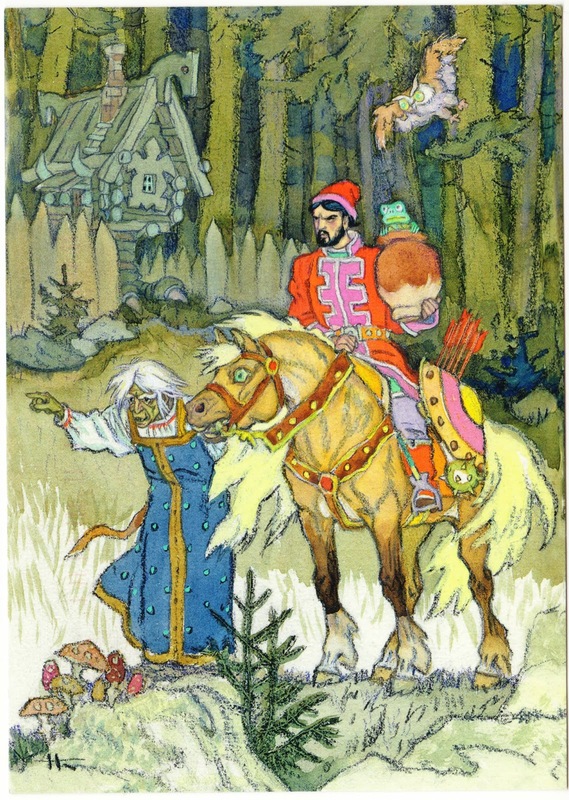 The postcard features an illustration from the Russian fairy tale "Go I Know Not Whither and Fetch I Know Not What." It features, as you can see, a frog in a jug and a nicely dressed Baba Yaga. That's her hut on chicken leg(s) in the background. Baba Yaga is a helper rather than an antagonist is this tale. It is one of many Russian folk tales featured in Russian Fairy Tales by Alexander Afanas'ev — a volume I highly recommend. My name is Aleksander. I'm 6 y.o. I'm just learning to read and write. My mom Olga will help me. Usually I go to class. Most of all I love to draw and build models from LEGO. Warm greetings to you. Aleksander also likes sports, trains, airplanes, dinosaurs, outer space and cartoons. He's a very cool kid with a great mom. Book cover: "Legends of the Earth"